I think it's a great example of something close to the "Dream of the Burning Child" that Freud, and then Lacan, analyze so wonderfully, and shows the relation of that analysis to allegory (unsurprising, I guess, that there's a connection between dream and allegory). 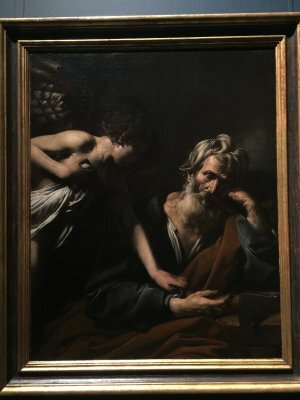 The angel is urging Joseph to wake and fly, but it is only in the dream that he can see the angel. We can see him because we are not part of that reality; we viewers recognize the dream because we belong to our own dream of human life, so far removed from the salvational history that this episode is part of. We want him to wake from our life, in which we share his dream of the angel, to go and save Mary and Jesus. And yet even in our dream of the angel, we're not in his dream world. The angel may be in both worlds, or all worlds: his dream, our dream, reality itself. The angel of course would be invisible in reality -- or how could we know, as we do because we see him, that this is Joseph's dream? But he is its emissary, and therefore can wake him. But the angel that wakes him cannot wake us, and when Joseph awakens, the angel will disappear from our dream world too. So, like so much Counter Reformation art, this painting shows the everyday truth of human life -- it's evanescence. The father of a newborn is asleep, exhausted, as one is. Some dream of the young man to come already haunts him, as he wakes up (in his dream) to the fact that the present is absolutely fragile, already past, and the future is already present. He looks so old -- is that part of his dream too? The age he'll be when he goes to see this painting with his son home from college for Thanksgiving? Or is that already the truth, so that like the friendly ghost Caspar Goodwood, he's been aged thirty years on the spot? Not "Come up and be dead," but: Wake up and be old! that's the demand the child makes, or rather that the father dreams the child makes. It's a wish-fulfillment, it's the demand the father wants the child to make, dreams he makes. He dreams that the child will live and thrive, and wakes up, old and exhausted, to try to make that dream come true. Eliot challenging the die-hard defenders of Milton: "The kind of derogatory criticism that I have to make upon Milton is not intended for such persons, who cannot understand that it is more important, in some vital re­spects, to be a good poet than to be a great poet." So Eliot's distinction comes from Milton. Just saying. So Milton fills space as well, with God. Or does he? God does "my self retire" to give way to freedom. If that retirement is absolute, as Empson suggests it might be, i.e. that God might "abdicate," then we're in Gnostic territory, and space becomes a true abyss. So it may be that Milton's thinking anticipates Einstein's even as it parallels Descartes' and Newton's.